ASAE’s Technology Conference came to a close last Wednesday after two days of association and nonprofit talk, tech solutions, educational workshops, influential speakers, ugly sweaters and even an Elvis impersonator. Our CEO Sergei Dubograev, COO Brad LaTour and Director of Sales John Carter represented the Clowder™ team during the event. Challenges currently facing associations and nonprofits were the same across the board. Memberships are stagnant or declining and there’s an overwhelming need to modernize. When asked about mobile, there was a consistent, “we know we need to start thinking about it” from executives. “They’re all at the point of realizing members, especially younger ones, are not using websites or checking emails,” Sergei explained. “Organizations are sending more emails and in return, earning less engagement.” For some, mobile seemed to be a far-off, down-the-road, in-the-future kind of solution. “Some executives had a mindset of wanting to fix all of their current problems then try to take on mobile,” Brad mentioned. “Our mission was to educate how native mobile solutions can now solve many of those challenges.” In today’s market, mobile must come first in order to remove disconnect and inefficiency between members. Event apps were brought up in conversation often as they tend to be an association or nonprofit’s first attempt at going mobile. Brad pointed out, “People are beginning to see that when using an event app, it does nothing for engagement beyond the 2 or 3 days of the event. These apps always die off and get deleted.” It’s not enough to try and connect members during conferences or conventions once or twice a year. It’s the pre and post-event communication that makes a significant impact on membership retention. We walked away from the conference with a ton of validation, new clients, great feedback and ideas to ponder. It was amazing to be in such an extremely supportive and collaborative atmosphere as attendees constantly exchanged thoughts and solutions with one another for organizational growth and progress. The variety of tech present really got people thinking. Having VR and AI setups, for example, was a valuable experience for many. “It wasn’t to tell every association or nonprofit to go out and incorporate VR and AI, it was to open their eyes to how much advanced technology we now have access to,” Sergei discussed. The organizations there have always been all about their AMS. 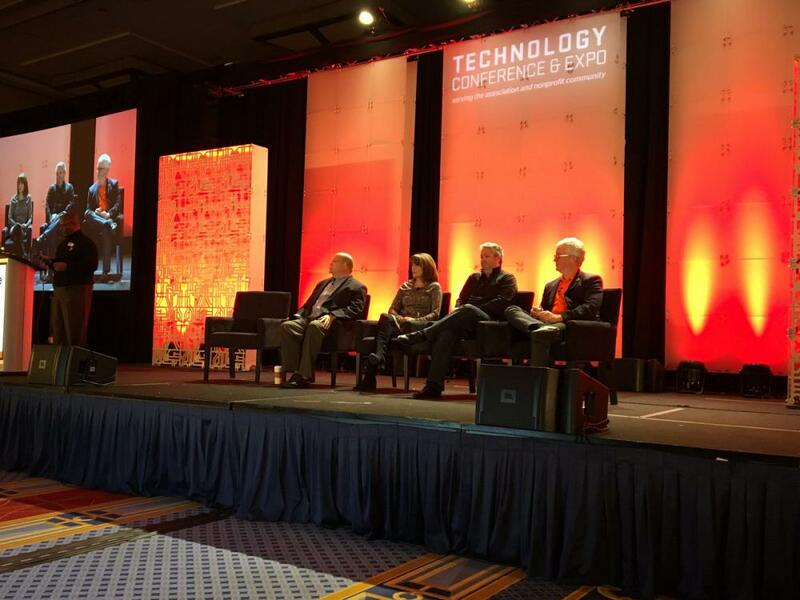 During the Town Hall panel, American College of Chest Physicians CIO Ronald M. Moen created a discussion around the potential of abandoning the traditional model in which the AMS is at the center of an association’s technology infrastructure. Instead he recommended connecting everything to an enterprise service provider in order to avoid connecting each component to one another “like cousins.” Your AMS should be one system that feeds into a data core. Once you’re able to then collect that data, properly utilizing it is vital for increased productivity. Providing a newer solution in the space, it was incredibly powerful to have the support of our ASI partners. Their iMIS software is very well-known within this community and Clowder™ being their new Authorized Mobile Product Partners opened up many conversations with fellow attendees. It is so important that these larger companies explore and partner with new solutions. There is a lot of opportunity for expansion. “Everyone on the expo floor had a phone in their hand and was communicating with it”, John expressed. “The habits are there. Members are mobile just as these executives are. Give them their dedicated app.” Sergei recalled a quote from one of the breakout sessions urging associations and nonprofits to “take 10% of what you’re doing that’s not working, let it go, and replace it with innovation.” These organizations tend to get stuck doing things the way they’ve always been done. Removing that hesitation to take on new strategies opens a world of opportunity. One of the many topics discussed at the conference was what causes that hesitation. The most significant is the fear of failure and blame. Organizations have to see beyond these fears. It’s better to test new ideas rather than continually lack any forward-thinking initiatives. We want to thank ASAE for putting on this great event that gathered the best in associations and nonprofits and the tech that allows them to thrive. We also want to shout out ASAE’s CIO Reggie Henry for taking the time to hang out with us and really understand Clowder™’s purpose. Catch us at next year’s conference! We’ll be the guys in blue with the giant phone. Clowder™ is the #1 native app solution for associations and their members. Uniquely tailored, affordable and built within 60 days, this is the best tool for bringing members together in one centralized, mobile hub to better accomplish a network’s overall goals and purpose. To see what Clowder™ can do for you, schedule a demo!